KARACHI: Dozens of journalists gathered outside the Karachi Press Club on Tuesday and staged protest demonstration against “enforced disappearance” of a young reporter associated with Daily Jang last week. 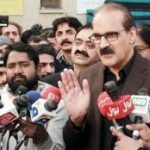 The demonstration organised by the joint action committee — an umbrella body representing KPC and factions of Karachi Union of Journalists — demanded the government safely recover Matloob Hussain Moosavi, who was allegedly taken away by unknown persons from his home in Karachi last Saturday morning. The family of Mr Moosavi alleged that around two dozen persons wearing masks scaled the walls of the journalist’s home in Salman Farsi Society at around 4am and took away the reporter. Addressing the demonstrators, leaders of the journalist fraternity including KPC president Imtiaz Khan Faran, secretary Arman Sabir, Fahim Siddiqi and Tariq Abul Hasan of KUJs condemned the incident and asked the authorities concerned to produce Mr Moosavi in a court of law if he had done anything against the law of the land. Such moves, they said, were not only damaging the image of institutions but also causing harassment among the journalist fraternity.